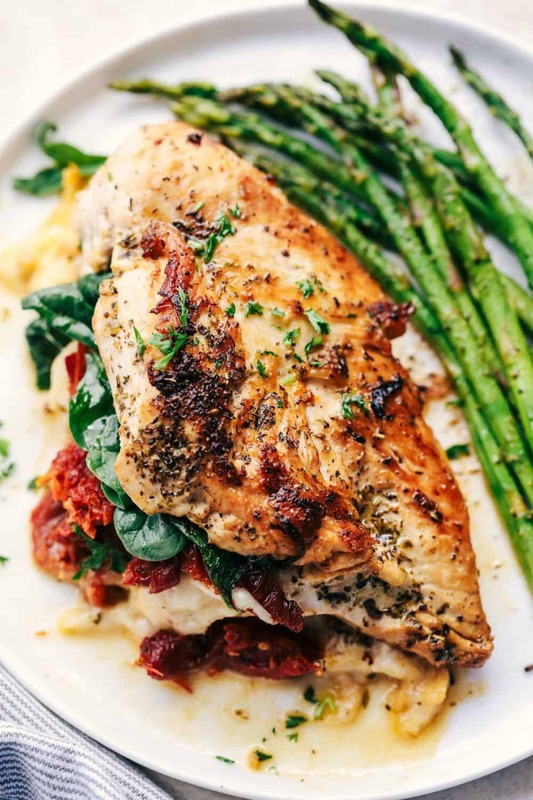 Stuffed Tuscan Garlic Chicken are tender and juicy chicken stuffed with mozzarella cheese, sun-dried tomatoes, and spinach that gets baked in a creamy garlic sauce. This meal will blow the family away! I have finally jumped on the stuffed chicken boat. It is mega popular right now and oh boy, why did I wait so long!? 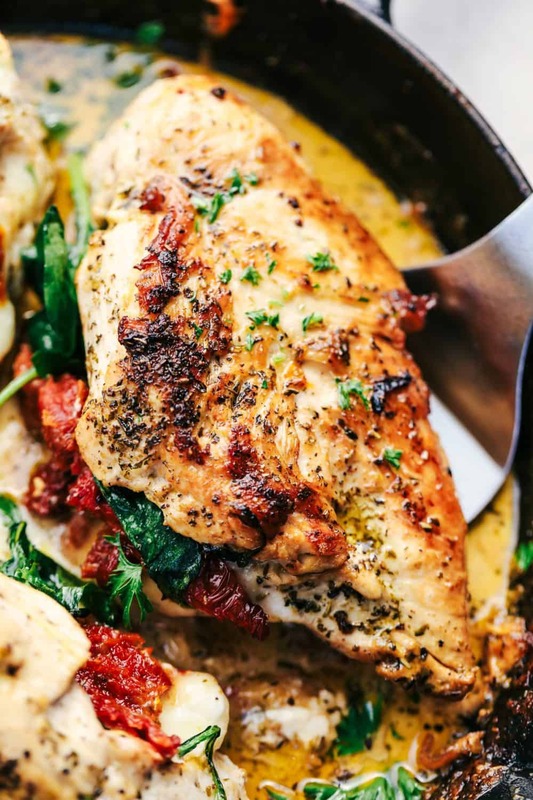 I took the ultra mega popular Creamy Tuscan Garlic Chicken that is on my site and made something incredible. A thick chicken breast gets coated in italian seasoning and stuffed to the brim with mozzarella cheese, sun-dried tomatoes, and spinach. It takes no time at all before it is in the oven and on the dinner table for the family to devour. The chicken gets pan seared before it enters the oven. The cheese just starts to melt and is so ooey gooey delicious. I went back and forth trying to decide if I should bake it in a creamy sauce because the chicken is so delicious on its own. But I made the decision to bake it in a creamy garlic sauce and it was the BEST decision! As soon as this chicken comes out of the oven you can just see the melty cheese just oozing out of the sides. And the smell of the sun dried tomatoes and seasonings is incredible. My family could not eat this meal fast enough! This is truly a restaurant quality meal that you can make right at home. You are going to impress even yourself on this one! This is hands down one of the best things that has happened to this blog. Your family is going to go crazy for this recipe just like we did! Preheat the oven to 375 degrees. Prepare the chicken by cutting slits into the sides. Stuff the chicken by placing the cheese on the bottom, followed by sun-dried tomatoes, and spinach. Seal with toothpicks by placing them in diagonally. Use 1 Tablespoon of the olive oil and coat the chicken with the oil and italian seasoning. Add a tablespoon of oil to a large skillet. Sear each side of the chicken until golden brown. To make the creamy garlic sauce, in a small bowl whisk the heavy cream, chicken broth, garlic powder, italian seasoning and parmesan cheese. Pour in the bottom of the skillet surrounding the chicken. Place in the oven and bake for 20 minutes or until cheese is bubbly and chicken is cooked until no longer pink. This is similar to a pesto and tomato stuffed chicken breast I make! Love the addition of a creamy sauce. I can’t wait to try it! This was a winner in our house one. Company dish for sure. Love your recipes, although have to half for the to of us. I made this tonight for company! What a hit. Really really good. Wouldn’t change a thing. It will be my go to now when I want to impress! I could have eaten the pan sauce with a spoon!!! Do you use boneless chicken breasts? Why did my sauce look whiteish where yours looks reddish? You use three chicken breasts but have four servings? Is this a typo? Sounds delicious and I will make it for my volunteers on Saturday! 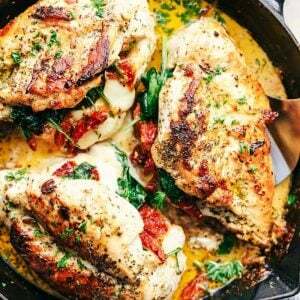 THIS chicken recipe is absolutely FABULOUS! I used one huge breast and the same amount of sauce that was intended for three chicken breasts……it was the prefect amount. I would suggest for three or more breasts, that you should double or triple the sauce recipe. It was an easy-to-make dish and clean-up was minimal. I made this dish for my family night and it was a hit. Then i posted pictures on Snapchat and my inbox was flooded with people drooling over it and asking for the recipe! Definitely will be making this again. Can I make the creamy Tuscan chicken a day ahead? I tried this recipe for the first time and it was absolutely delicious, thank you so much for sharing I now have a favorite fancy dish to make for my wedding anniversary. I only changed the powder garlic for fresh since I love fresh garlic but other than that wouldn’t change a thing. 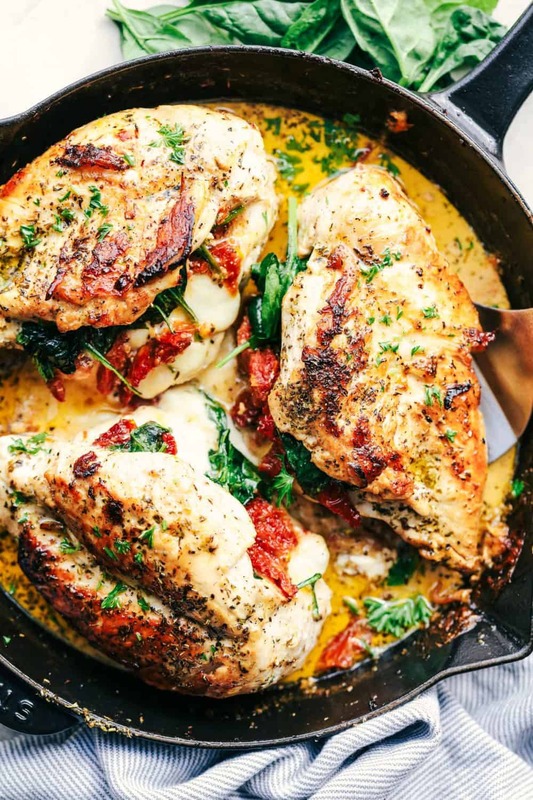 Alyssa….I regularly use one of your recipies, and am never disappointed…..I’m confused about your Stuffed Tuscan Garlic Chicken….you talk about adding/making the “creamy”sauce, but never mention what you do with it in the instructions….in the picture you show the chicken breast in the skillet…..after you bake them, than what?? ?